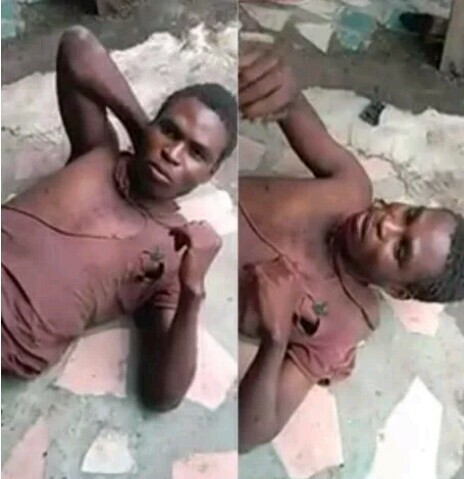 Home > PHOTOS > Suspected Thief Who Pretends To Be Mad, Apprehended While Stealing In Abia State ! Suspected Thief Who Pretends To Be Mad, Apprehended While Stealing In Abia State ! An alleged thief has been apprehended by the residents after he was caught in the act in Abia. A man who disguises as a mentally unstable person in order to steal, has been apprehended in Abia state. In a video posted online by Facebook user, Ebony Inyamah, the suspect confessed to the crime and gave the name of his accomplices as John, Chinedu and Ifeanyi. The report revealed that he usually steal from shops at night in Umuahia, the state capital while pretending to be mad by the day. He was nabbed on Friday by residents who noticed him during operation.